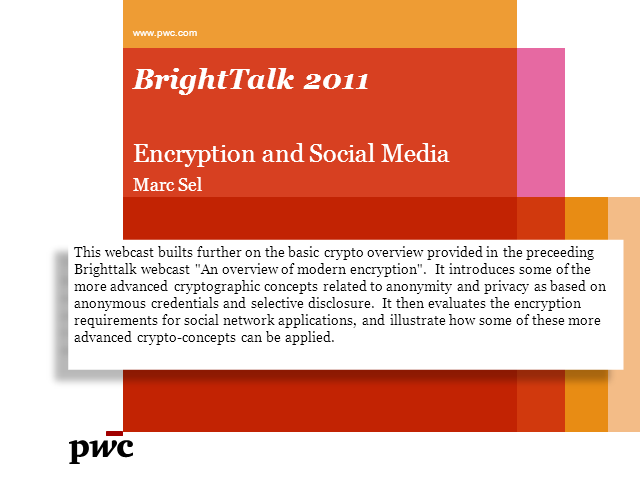 This webcast builds further on the basic cryptographic overview provided in the preceeding Brighttalk webcast "An overview of modern encryption". It introduces some of the more advanced cryptographic concepts related to anonymity and privacy as based on anonymous credentials and selective disclosure. It then evaluates the encryption requirements for social network applications, and illustrate how some of these more advanced cryptoconcepts can be applied.